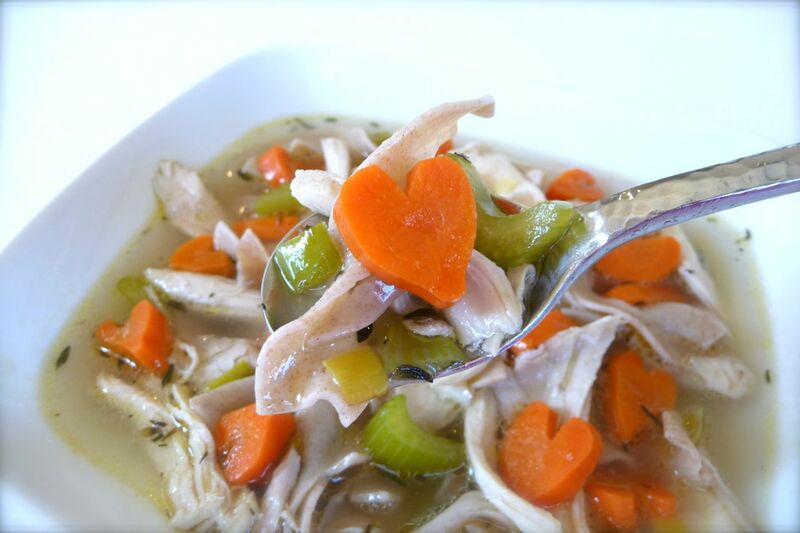 When it comes to comfort food, nothing says nourishing like a nice hot bowl of homemade chicken noodle soup made with love. 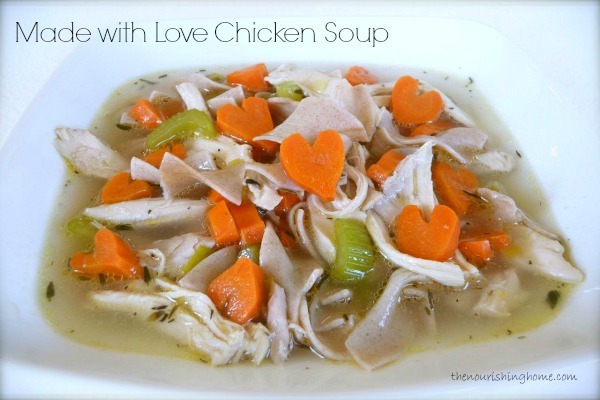 The base of this recipe is a wonderful, rich homemade chicken stock made with organic chicken and lots of delicious vegetables and seasonings. To create the adorable carrot hearts, check out this fun Heart-Shaped Carrots Tutorial. 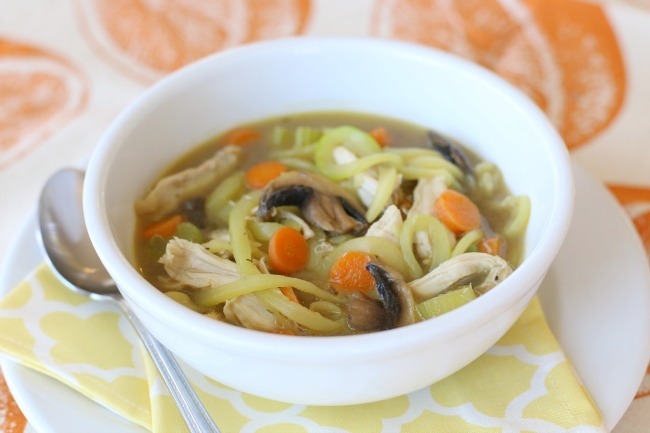 For another wonderful chicken soup recipe that’s perfect for cooking with your kids, be sure to try my family-favorite Stone Soup – a deliciously nutritious and fun way to make memories to last a lifetime! In a stockpot over medium heat, add olive oil, celery, carrots and leek. Sauté until veggies start to soften. Add stock, bay leaves and thyme. Bring to a boil, then reduce to a simmer. Allow to simmer about 5 minutes. Then add shredded chicken and noodles of your choice, if using. Turn up heat a bit to bring soup to a gentle boil and cook until noodles reach desired consistency. Turn off heat and remove bay leaves. Add fresh parsley and salt and pepper to taste. Enjoy! A favorite variation on this delicious recipe is to toss in some sliced mushrooms during the veggie sautéing process. Then add about 4 cups of zoodles (zucchini noodles) at the end of the cooking process and allow them to soften to desired texture. 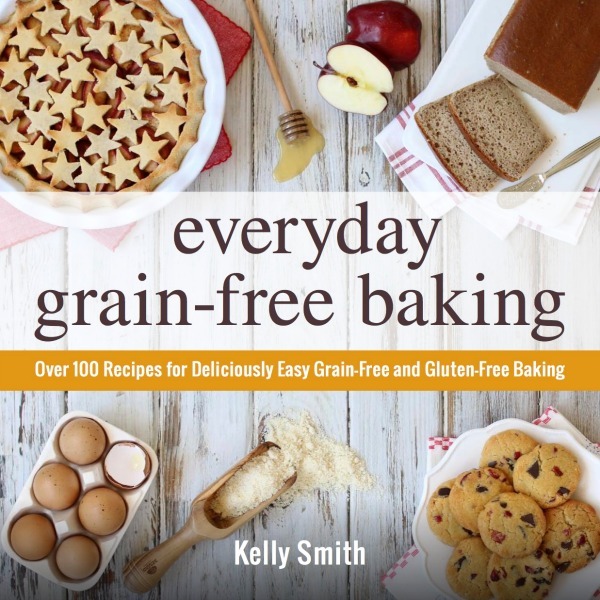 Makes the perfect grain-free soup made with love! Awe sum recipe made this for lunch and its the first chicken soup my wife could eat in 5 years. Big hit for the family! The carrot hearts are so sweet…thanks for sharing this…. I love it!!! What a simple and delicious recipe! I’ve made this several times now, including one time for a sick friend. As a gluten free alternative I used quinoa and that worked really well (I added it already cooked). Thank you so much for the inspiration. Just a note: this has become a go-to soup of mine. It is so simple & has amazing flavor. I use zucchini noodles for grain-free soup & it turns out great. And it’s even better heated up during the week for lunch. I could seriously eat this every day. Thank you for sharing it! This soup was super easy to make and delicious. I added a little butter when I was sautéing the vegetables. I didn’t use noodles. I put small rice cakes in that I use for korean soups. Everyone raved about the flavor. Definitely will make again. So yummy!